Dual Disc and Tread Braking Systems. 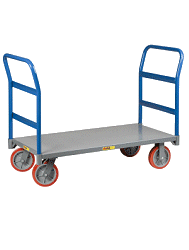 Stop your hand truck safely and effectively with B&P Liberators line of high qaulity aluminum brake hand trucks. Controlling loads, traversing stairs, and ramps with a brake hand truck will prevent injuries and save loads from damage.